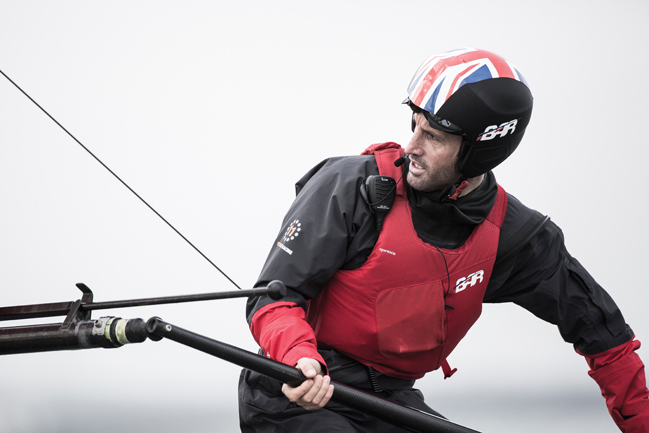 As teams grapple with new rules for the 2017 America’s Cup, Ben Ainslie Racing is using software to get ahead. There is no second place. In the America’s Cup, all that matters is crossing the finish line first in a high-speed chase that sees huge catamarans ‘fly’ above the water at speeds of 55mph. 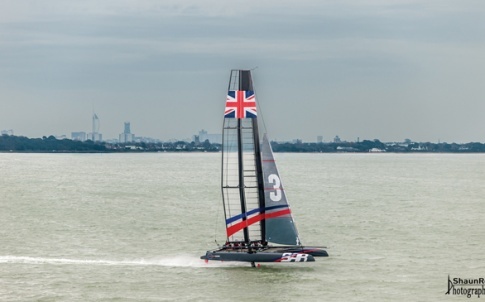 In 2017, the Ben Ainslie Racing (BAR) team hopes to compete against defending champions Oracle Team USA off the coast of Bermuda. Its aim is to bring the cup back to UK waters for the first time since 1851. Engineering design is as crucial as sailing skill. In anticipation of this, BAR has recruited heavyweights in the design world. In April, for instance, ex-McLaren chief executive Martin Whitmarsh will be joining the group’s dedicated team of engineers. The team will also partner with four-time world champion Red Bull designer Adrian Newey. Right now, BAR is in the midst of a two-and-a-half-year timetable to design the best catamaran for the race. On the day The Engineer spoke to the team, they had just received news that the 2017 America’s Cup is planning to implement a series of major rule changes to reduce team operational costs. The main change is to race in a smaller boat than the previously announced AC62 catamarans. This means going back to the drawing board to come up with the most optimal design. ”The full boat model is captured in both 3D and 2D and the drawing and model management is achieved using Teamcenter, with NX integration. To do this, BAR has teamed up with Siemens to use its NX and Teamcenter software. NX is used for computer-aided design (CAD), while Teamcenter helps with product lifecycle management (PLM). Together, they run through tens of thousands of individual components and several hundred thousand lines of computer code. “The most valuable factor of the software is that its tool set is very diverse,” said Simon Schofield, a designer at BAR. “NX is used for automated and scripted processes for the batch creation of geometry, which is then used in the research and development process. The full boat model is captured in both 3D and 2D and the drawing and model management is achieved using Teamcenter, with NX integration. “BAR also uses its simulation capabilities for stress analysis including stick-model simulations, basic solid FEA [finite element analysis] and composite FEA,” said Schofield. He added that with NX, BAR can generate hull shapes far more rapidly than previously possible. Whereas processing geometry used to take hours, it now takes about 20 seconds. This is particularly valuable in light of the new rules. While most of the America’s Cup teams have been working on 62ft (19m) catamaran designs, the latest drafted rule changes may mean they will be sailing 45ft catamarans. It’s a big change, designed to give smaller teams a chance of competing with better-funded competitors. 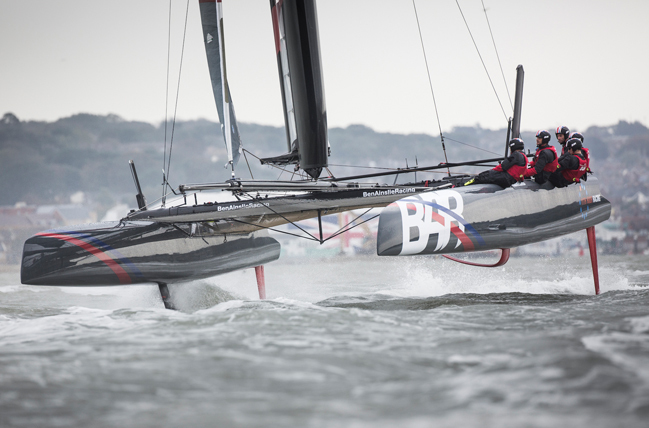 In the last race, the sails on the AC72s were 13 storeys high and built like aircraft wings. These allowed the twin hulls of the catamarans to hydrofoil over the water. Geometries are complex and speeds are up to 55mph; even slight changes to its shape can have a huge impact. As part of the rules, teams are not allowed to launch their boats until 150 days before the first event of the 2017 America’s Cup qualifiers. That means most of the design, analysis and performance testing has to be completed on smaller-scale models, as well as in a virtual environment with computational fluid dynamics (CFD) and FEA helping with most of the design. While the team may never use some of the shapes they design, exploring all the possibilities means they know they are not missing a trick. Before the final design, BAR also uses simulators and a test boat to get sailors thinking about the best positions to place controls. Combining FEA with data captured from sensors on the test boats allows designers to get a better idea of safety implications and performance. The software also helps the team comply with strict regulations, such as submitting documents to the Rules Committee to show the exact materials and manufacturing techniques used. While this can be done manually, Teamcenter can do this for BAR automatically. “The America’s Cup is a competition where you cannot afford to have an unreliable boat,” said Andy Claughton, technical director of BAR. “The most important challenge for us is to build the sailors a fast boat in which they have confidence. If they don’t have confidence, they won’t be able to go for a manoeuvre that could win the race.